Parma is famous for its ham and for its cheese, both of which are magnificent. 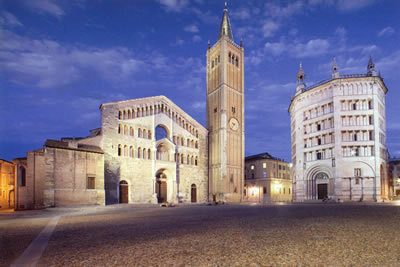 But the city has another priceless jewel: an assembly of some of the most impressive ecclesiastical buildings in Italy. Its cathedral and the separate baptistery (pictured) attract visitors from all over the world. Indeed, the 13th and 14th Century frescoes which cover the interior of the latter make it possibly the grandest setting for the sacrament of Baptism in the whole of Christendom. The historical centre is devoid of top-quality hotels, however, so I was forced to go a little further out for my lodgings. But this was no penance, for the five-star Grand Hotel de la Ville – a modern building, opened in 2003, with plenty of parking (an important consideration in Parma) – was only a five minute taxi ride from the main sights. I found it offered me both comfort and convenience. In the public areas are chairs and tables by Mies van der Rohe, so those of you who like these Modernist icons will be happy. I certainly liked the friendliness and helpfulness of the members of staff, who consistently went out of their way to ensure that all my little requests (like making my bed extra-soft) were met promptly and efficiently. 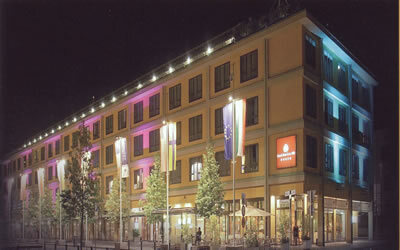 The hotel has 101 rooms and 9 suites. My Junior Suite (number 316) was on the third (top) floor (280€-350€ a night, bed and breakfast for two, according to season). This was a bright and spacious apartment of white, cream and beige. It was full of natural light from two large windows. The view was of little interest, so it suited me to keep the net curtains drawn. Double glazing ensured restful quietness and air conditioning kept the outside heat at bay. Off my hallway was a walk-in wardrobe with a private safe. The bed-sitting room had plenty of space for a sofa, an easy chair, a writing desk and a glass-topped dining table. Lighting was provided by three table lamps and a standard lamp. In the modestly-sized bathroom I found a tub of decent size with a jacuzzi facility and a shower over, one wash basin, a bidet and the loo. The hotel dining room is the Ristorante Parmigianino. (Parmigianino was the painter of the remarkable frescoes in the Church of Santa Maria della Steccata in the city.) It is on the ground floor, and has a pleasant terrace with sun shades and wooden tables and chairs. Here I enjoyed my breakfasts al fresco. To me were brought pots of coffee, dishes of ice cubes and my concluding cappuccini, and from the buffet I secured plates of ham and cheese (Parma ham and Parmesan cheese, of course), helpings of bacon and scrambled egg, bowls of pineapple and melon and fruit salad and slices of the most delicious apple cake. All this food was of high quality, a fact which heightened my anticipation of dinner on the final evening of my stay. Chef Luca Paffetti offers an attractive menu of straightforward Italian dishes. He uses good ingredients, has an eye for pleasing presentation and possesses considerable culinary skills. The ambiance of the restaurant – set by the grey napery, the grey carpet, the spotlights, the good Bormioli glassware and the round, white plates – is cool and sophisticated. And the service provided by maitre d’ Fulvio Cairoli (an excellent gentleman, who used to work in London at Claridge’s) is friendly and proper. My dinner did not disappoint. The short wine list has 75 offerings, including 5 half-bottles. All, except the champagnes, are Italian. Vintages are not given. Prices run from 11€ for a local red lambrusco to 100€ for Guado al Tasso from Tuscany. Tignanello is 90€, Planeta merlot is 30€ and Ruinart brut champagne is 60€. I drank a chardonnay with hints of vanilla from the Alto Adige (A.A.Doc Kreuth Terlano – 22€). Parma is a beautiful city. You should certainly visit it when you are exploring the area south of Milan. And in the Grand Hotel de la Ville Parma has a comfortable and stylish hotel which makes an excellent base from which to sally forth to explore its glories. Largo P. Calamandrei 11, 43121 Parma, Italy.